Eye On Tampa Bay: Charlie? Who are you kidding? It's getting that time of the season, when the poitical reporters need to frame up the narrative for the upcoming elections in November. In the last week, much of the Florida political reporting was focused on a new poll showing Charlie Crist firmly in the lead over Governor Rick Scott. The central message of Gov. Rick Scott's re-election campaign — that he's the one best suited to keep improving Florida's economy — so far isn't convincing most Floridians, a new poll shows. Despite the governor and state GOP every day pounding home the message that his policies are revving up the state's economy that tanked under Gov. Charlie Crist, a narrow majority of Florida voters, 47 percent to 42 percent, say likely Democratic nominee Crist would do a better job handling jobs and the economy than Scott. Overall, 46 percent of those surveyed in the Quinnipiac University poll said they would vote for Crist today, and 38 percent said Scott. Fifty four percent — including nearly 1 in 4 Republicans — said Scott does not deserve a second term, and 38 percent said he deserves re-election. Former Governor, Charlie Crist, who's picture must be in the dictionary under "flip-flop", is leading this latest poll of registered voters by 8 points. Do these voters recall the results when Crist was governor? Nearly worse in nation unemployment, budget deficits, housing crash? So unpopular he chose not to run for re-election? On taxes, he has also spoke out of both sides of his mouth. In 2005, he signed the Americans for Tax Reform’s Taxpayer Protection Pledge, yet broke his pledge in 2010. He was also signed the No Match, No Vote law, yet has recently been campaigning against any voter ID laws. Formerly pro-life, pro-2nd Amendment, anti-gay marriage, he has now flipped on all these issues. He was even calling for lifting the federal ban in offshore drilling... before, of course, he flipped. Crist is an opportunistic politician, in the worse sense of politicians. It's obvious he's devoid of principles, really does not believe anything. It's not as if any new evidence or facts have the context of these flips and flops. Since his political career is obviously at risk, he grabbed at the opportunity to change his stripes, especially given the void of decent Florida Democrat political leadership. Few politicians have changed on these issues during the last few years, and absolutely no politician has come close to changing their colors like Crist. He really only cares about his political power. Don't the voters... and Democrats understand this? Do they have any value in consistency, principles, and honor? Are there not any other eligible or even semi-qualified Democrats? 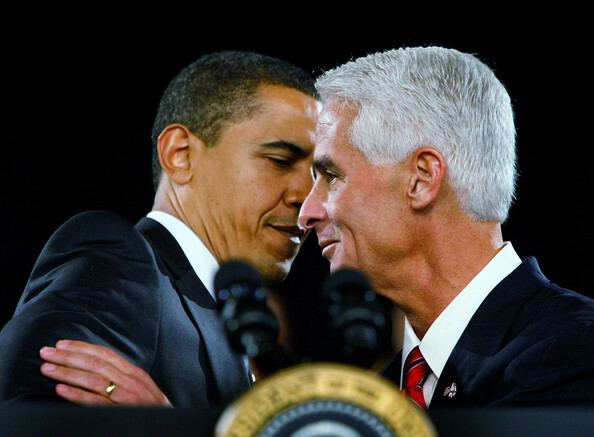 Crist exploited a void in the Florida Democratic party. Democrats are having problems at the local level fielding qualified candidates. Just one Democrat remains in the running with four Hillsborough County Commission seats up for election now that candidate Mary Mulhern, a Tampa city council member, has withdrawn from the District 7 race for health reasons. That means Republican Commissioner Al Higginbotham is the favorite to win the one commission seat Democrats had a shot at. Higginbotham faces two Republican opponents, Robin Lester and Don Kruse, whose campaigns are still looking to gain traction. To some observers, this scenario raises serious questions about the Democratic Party's ability to compete in local elections. Democrats have 61,000 more registered voters in the county than Republicans, yet the GOP has a solid 5-2 majority on the commission. And the problem is not just local to Hillsborough County. There certainly is a lack of development of decent candidates across Florida, as evident with Crist, as well as Alex Sink, the Hillsborough carpetbagger now running for Congress CD-13 in Pinellas. But do the Democrats even know what they are getting with Crist? How can they assess a candidate, who just a few years ago, as Governor, they despised, as he took positions antithetical to the Democrats? Crist had his chance and he blew it. His results were not good. Florida was hit hard by the economic down turn during his term. Crists policies of embracing FHA and federal tax credits for unqualified home buyers, further led to propping up the housing bubble, making it worse when it burst. This was why Florida lost the 3rd most jobs in the country under Crist. He took the Obama stimulus money. Rather than use it as intended, Crist used it to paper over severe state budget issues rather than address them head on. No wonder he ran away from the mess he created. Crist saw the writing on the wall, and tried his luck with running for Senate, where he metamorphosed from Republican, then as he lost to Rubio, transformed into an independent, then completed the full metamorphosis into a Democrat. Well, we think he's Democrat. At least that's what he says. But who really knows? If he does get elected, the odds are overwhelming that he will face a Republican legislature. How will he move any of his new found policies with a Republican legislature? Does anyone really think the Republicans will cooperate and partner with the apostate Crist? Or will Crist metamorphose yet again back to Republican polices, since it will the only get anything done in a Crist administration? Why do we want some obviously professional political chameleon whom we have no idea what he really believes or what he will do? Rick Scott's first mission was to clean up the Charlie Crist mess he left behind with some tough budget decisions early in his term. Many political pundits and operatives pounded on him mercilessly for budget cuts. Easy for them to do. They were not responsible for recovering Florida from the Crist mess. Rick Scott is not a professional career politician. He had never run for office prior to winning the governor's race in 2010. He's not great at schmoozing, hiding behind political shifting sands, and has had a mis-step or two along the way. But he has stayed his course, focused like a laser on jobs, been consistent on his messaging. and has the results to show for it. Florida created 196,000 new jobs in 2013, second most jobs in the country. Is he a bit awkward at times in public? Yes. Has he learned a few things along the way? Yes. Is he focused on his role to help all Floridians? Yes. Is he getting results? Yes. Because he's not a smooth talking career politician, he's not trying to be some one he's not. He is being himself. And It's Working. We've had enough of Crists soundbites. Florida wants results, and that's what we're getting with Scott. Crist should be worried. At one point in 2010, in the Florida Senate race, he lead Marco Rubio by over 30 points. Enough of the career politicians.